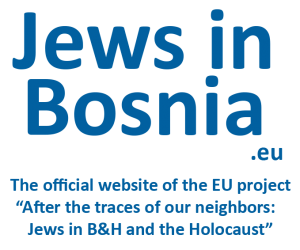 One of the project result, the photo-exhibition “Lost in the Holocaust: Jewish neighborhoods in Bosnia and Herzegovina” was opened at the gallery Novi Hram in Sarajevo on March 19, 2015, by the High Representative in Bosnia and Herzegovina Dr. Valentin Inzko. The photo-exhibition was organized by the Austrian Academy of Sciences, the University of Sarajevo – Institute for History and “La Benevolencija”. Please find here the event invitation and announcing poster. – Dr. Valentin Inzko, High Representative in Bosnia and Herzegovina, who stressed the importance of such project, praised the work of the authors, and remembered all the visitors that the Bosnian institution of „neighborhood“ („komšiluk“ in Bosnian) must permanently stay „alive“ as well as those who were members of such neighborhood communities over the time. The photo-exhibition was designed by the project scientific researchers Ms. Hasanhodžić and Mr. Rustemović, who were the authors of the exhibition. The co-authors of the exhibition were the 3rd and 4th year History students from the Philosophical Faculty of the University of Tuzla, The Archives of the Tuzla Canton and the Association of the archival workers of the Tuzla Canton. The photo-exhibition, as introduction to the book presentation, apart from the 15 Bosnian towns and their Jewish history that were dealt with in the book in detail, also presented additional six towns regarding their Jewish past. Each of 21 panels was telling the story about the Jewish history of the town concerned, about the Jewish families, about neighborhoods and neighbors. All the panels were in B1 format (1000 cm X 70 cm) and were printed in color (sepia tones). The language of the exhibition was Bosnian. Media representatives have interviewed the distinguished guests as well as the authors. For media reports see the Media section of the website. The photo-exhibition panels were donated to the project partner “La Benevolecija” from Sarajevo. The representatives of many cultural institutions (museum, archives, etc. ), different educational institutions such as universities (e.g. rector of the University of Sarajevo), research institutions, the Holocaust survivors from Bosnia and Herzegovina, members of the Jewish community from Sarajevo and elsewhere (representatives from the Jewish community Niš (Serbia) and from Mostar (Bosnia and Herzegovina)), project partners, politicians, diplomats i.e. embassies (Austrian and Polish ambassador), and media representatives were present at the event. The visitors were looking at the exhibition in a good atmosphere, enjoying the cocktail and buffet aftertime and enchanting the questions, opinions and impressions of the exhibition. Recognizing the great efforts of the authors, they praised the exhibition and its contribution to the development of the cultural memory. In the meantime, the photo-exhibition was also translated into English by a project team and made available online at the project website for broad international public as well.